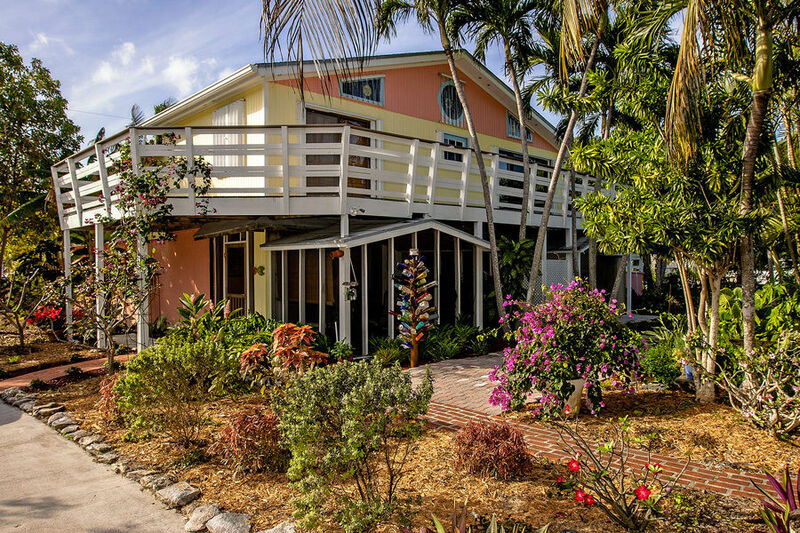 Here in the Florida Keys, it's not just the holiday season, it's real estate season! The number of calls and showings I receive is steadily increasing and by looking at the numbers in the MLS, I'm not the only one seeing this trend. In the first two weeks of December there were 47 new listings taken, 33 pending sales written and 32 closings. 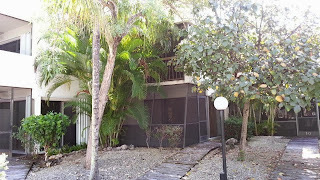 The new listings include a nicely priced corner unit 2/1.5 condo in Key Largo for just $185,000 at the Landings of Largo. Amenities at Landings of Largo include a marina, boat ramp, two pools, clubhouse and two tennis courts. 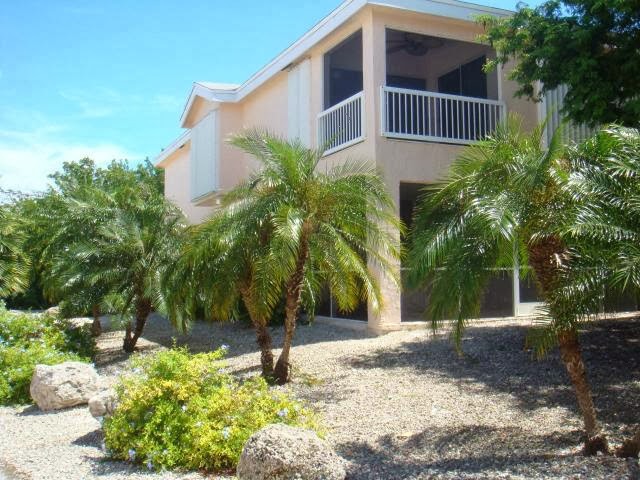 Pending listings include a townhome at Moon Bay in Key Largo. This 2/1.5 two story townhome is a bank owned property and was offered at just $231,300. This pricing generated a lot of activity and multiple offers. Sales include a condo also at Moon Bay. This 2/1.5 condo is in the midst of a dramatic remodeling job and will soon be available as a vacation rental. This unit also features covered parking. Amenities at Moon Bay include marina, boat ramp, tennis court, clubhouse, heated pool and more. If you would like additional information on any of these listings, don't hesitate to call or email me. Ocean Harbour, one of the most exclusive condominiums in Islamorada! Enjoy luxury condo living & spectacular ocean views surrounded by gorgeous tropical landscaping - this is truly an island paradise. This 2 BD / 2BA condo has endless views overlooking the pool, marina & Atlantic, and includes a 30’ slip. With over 1,500 sq. ft. of living space, this condo offers ample living space with a split bedroom floorplan. The master bedroom enjoys open views of the ocean and has a spacious master bath. Living at Ocean Harbour, located on 12 lushly landscaped acres right on the ocean's edge, offers more than gentle sea breezes. The finest leisure activities are here for all resident, guests and visitors to enjoy. On-site amenities include oceanfront clubhouse, beach, marina, tennis, fitness room & much more. To learn more about Ocean Harbour, visit www.OceanHarbourIslamorada. "What is there to do in the Florida Keys?" I often hear this question when working with buyers that are new to our area. The answers are plentiful! We have some of the best fishing, diving and boating in the country. Key Largo is home to one of Florida's nicest state parks, John Pennekamp Coral Reef State Park, which is one of the underwater parks in the United States. Islamorada is known as the "Sportfishing Capital of the World". Marathon is home to Curry Hammock State Park, with one of the largest populations of thatch palms in the United States. Bahia Honda State Park features one of the Keys greatest beaches and camping. On Big Pine Key you'll find the National Key Deer Refuge, home to the diminutive Key Deer. And of course, Key West is famous for many things, including Mallory Square's sunset celebration, a major cruise destination and Fantasy Fest, to name a few. It never fails - when you tell someone you've just met that you're in real estate, the first question they ask is "how is the market?" Each quarter I compare the current year to the previous year to see how the market has changed. It's one thing to say it seems like the market is improving and another to actually see it in real numbers. 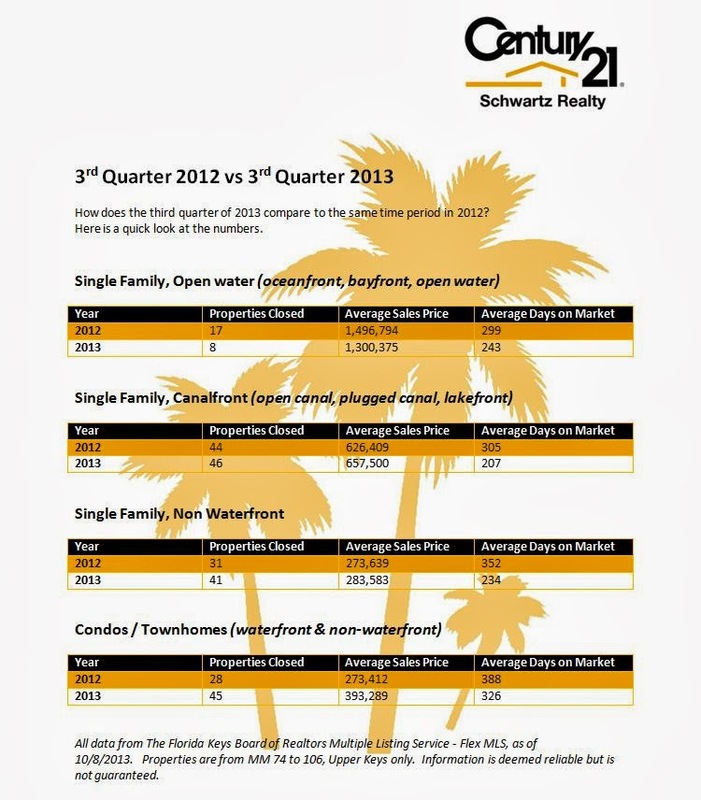 The 3rd quarter of 2013 has seen an increase in both average sales prices and number of properties sold in every segment but one, which was open water homes. Still open water homes are doing quite well. 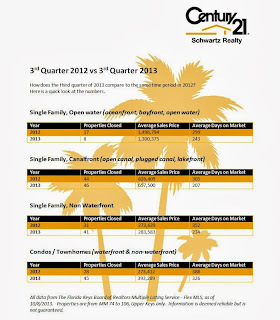 The drop in average sales price is due to two low priced comps that sold for below typical open water prices. Both condos and non-waterfront homes are doing quite well, with each seeing healthy increases in number of sales and average sales prices. If you're considering a purchase, now may be the best time to get into a Keys home as I predict home prices in the Florida Keys will continue to creep upward. Have questions? Call me at 305-522-3812 or email me today! This bank owned property generated a considerable amount of interest, most likely due to pricing. Priced at $300,000, this diamond in the rough received a total of 24 offers in 8 days! The sales price was $295,000. This home was in need of many repairs but was located on a clean canal just around the corner from Florida Bay, giving it great boating access. 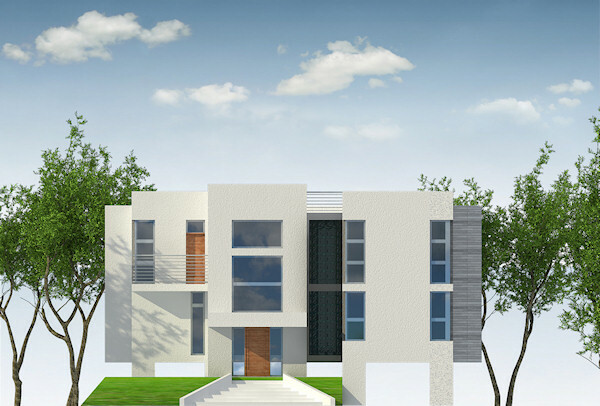 It has three bedrooms and three baths with over 1,600 square feet of living space. View more photos and a full description of the property at www.201NautilusDrive.com. I won't be surprised if we see this property fixed up and put back on the market fairly soon. The new owner has already begun repairs and has plans of selling it once repairs are completed. Stay tuned for more information on this property. 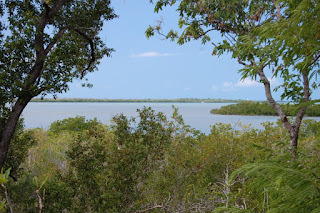 A lot of people dream about having a place in the Florida Keys that they can visit and call home. Many times, the cost of purchasing a home or condo stands in the way of this dream. A possible solution: a timeshare. A timeshare is a property with a particular form of ownership or use rights. These properties are typically resort condominium units, in which multiple parties hold rights to use the property, and each sharer is allotted a period of time when they may use the property. Typically, the time period is one week, and usually is set for the same time each year, although many do offer flexibility on when you can use the unit. 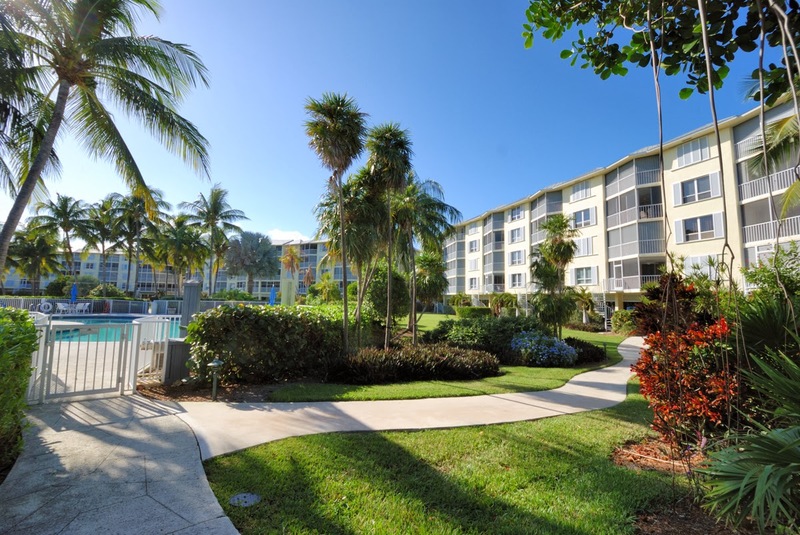 There are several timeshare opportunities in the Florida Keys, ranging in price from $2,000 to $95,000. 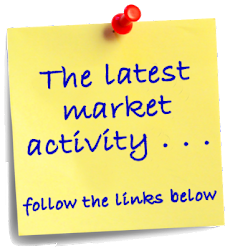 Click the link below to see the available units on the market right now. There is a lot of talk lately about the new changes to the National Flood Insurance Program (NFIP). Russell Yagel / Hershoff Lupino & Yagel, L.L.P. Full-risk rates now are being applied to newly purchased property, to property not previously insured, and to policies that are re-purchased after a lapse. Premiums for older (pre-FIRM) non-primary residences in Special Flood Hazard Areas will increase by 25% annually until they reflect the full-risk rate. Premiums for pre-FIRM business properties, severe repetitive loss properties (1–4 residences), and properties on which claims payments exceed fair market value will increase by 25% annually until they reflect the full-risk rate. Routine rate revisions will include a 5% assessment to build a catastrophic reserve fund. Premiums for properties affected by map changes will increase by 20% each year to reach full-risk rates. Owners of primary residences in SFHAs (Special Flood Hazard Areas) will keep the subsidized rates until the home is sold; the policy is allowed to lapse; a new policy is purchased; or a string of severe losses is experienced. Post-FIRM rates for all zone classes will be unaffected by Section 100205 of the Biggert-Waters Act. Thank you, Russell Yagel for providing this informative summary. Hershoff Lupino & Yagel, L.L.P. The home was built in 1957, and while it is in need of some repairs and updating, the property is loaded with potential. The right owner could make this "diamond in the rough" really shine. The property has a wide concrete dock, private boat ramp and a large backyard with water views. 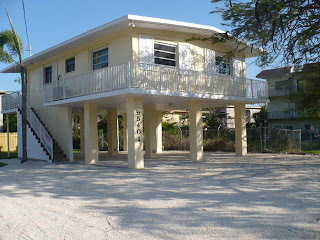 Additionally, the neighborhood has a private, gated sandy beach directly on Florida Bay, complete with grills and picnic tables, making it a perfect spot for a sunset cookout. 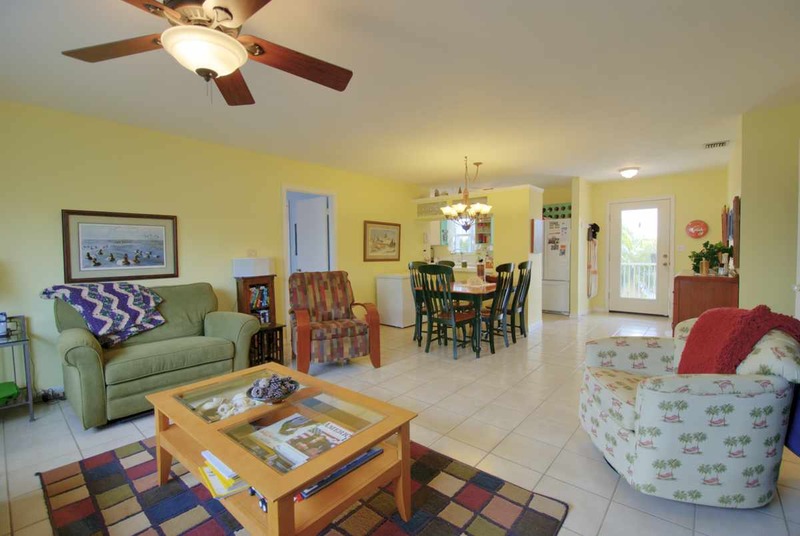 With a very open floor plan, the home offers a combined living and dining area as well as an inviting Florida Room off the kitchen overlooking the water.It has three bedrooms and three baths, providing ample room for family or guests. 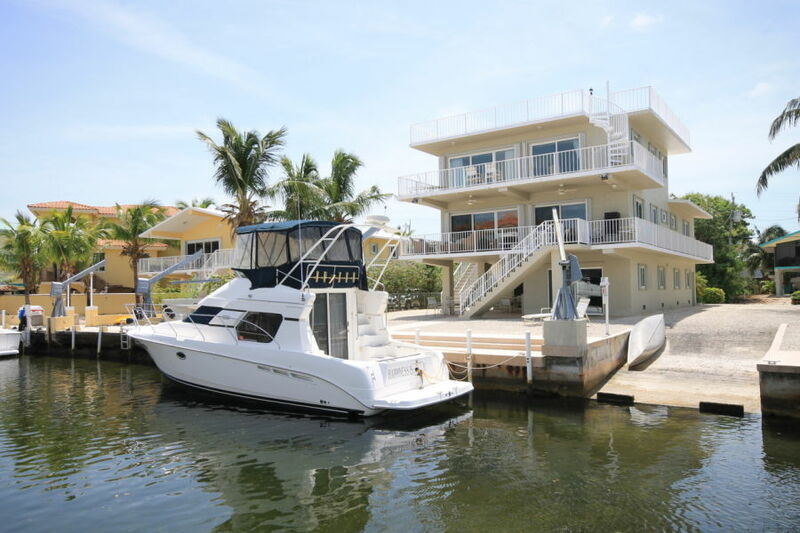 Like many homes in the Keys, this location is perfect for boating. Florida Bay is just around the corner and the Atlantic Ocean is minutes away via Channel Five. There is a large storage building, providing secured dockside storage for all of your boating, fishing or diving gear. Call today to start enjoying your new Florida Keys waterfront home in a great location at an unbeatable price! 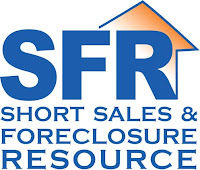 Having an offer on a short sale listing accepted immediately after it is listed is no longer an option if it is a property that would require approval by Fannie Mae according to recently announced requirements for Fannie Mae short sales listed in a multiple listing service (MLS). 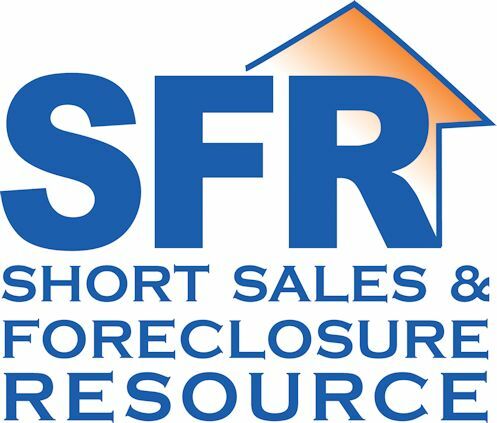 Starting August 1st, each new short sale listing must maintain an “active” status for a minimum of five days; and that time-frame must include at least one weekend. Freddie Mac announced similar guidance for Freddie Mac short sales. It’s important to remember two things: that the new rule only affects Fannie Mae and Freddie Mac short sales; and, though it directly affects sellers, it also indirectly impacts buyers’ offers. Fannie Mae wants short sale listings to be marketed in a manner that allows the market to see the listing. Properties Fannie Mae owns (REO listings) reflects the same philosophy since Fannie Mae won’t evaluate offers until the listing has been in the MLS and “active” for at least three days. While an offer can be presented at any time after the property is listed, the seller cannot accept any offer until the required five-day marketing period ends. A buyer’s agent could, for example, submit an offer on the first day a home is listed. However, they there should be wording in the contract that gives the seller five days to accept the offer if the property must follow Fannie Mae or Freddie Mac’s rules. Under Fannie Mae and Freddie Mac’s rules, the short sale property must be listed in an MLS that covers its geographic area where the property is located. For instance, a property located in the Florida Keys must be listed with the local Florida Keys MLS. 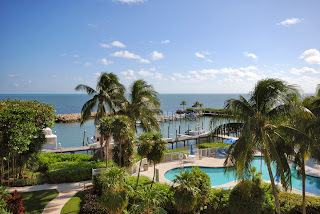 Listing a property in the Florida Keys with the Miami-Dade MLS may not be acceptable, since the Florida Keys is not the primary geographic area for that MLS. There's been a lot of talk about flood insurance rates here in Monroe County, and for good reason. On July 6, 2012, the Biggert-Waters Flood Insurance Reform Act of 2012 was signed into law. While the good news is the reauthorizing of the National Flood Insurance Program (NFIP) through September 30, 2017, the bill brings several substantive changes to the program, including several that alter the way premium rates are calculated. These changes will take effect October 1, 2013. 1.) Higher premiums for buildings below base flood elevation: FEMA has been instructed to stop giving premium discounts to properties that are below the BFE (base flood elevation), even if they were up to code when built. 2.) Pre-firm and grandfathered rates phased out: In the past, many structures were allowed to keep their original flood-risk rating, even when conditions and improved understanding had changed. For instance, a home that was built pre-firm (before 1975) may have been built in accordance with the code at the time it was built, but due to a change in flood maps, it may now be considered below the BFE. This home will no longer be allowed to keep the rate-class (flood zone and building elevation relative to BFE) that applied at the time of construction. The flood insurance for properties like this will be allowed to increase by 25% per year until they achieve the full premium rate. If you are considering a purchase in the Florida Keys, you will want to find out what flood zone the property is in and if the home is above or below the BFE. 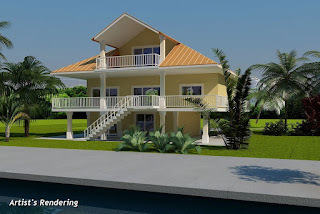 Ground level homes, particularly older ground level homes, should be researched thoroughly. You need to know the flood zone the property is located in and have an elevation certificate to determine what the elevation of the structure is. Elevated homes with ground level enclosures should also be researched to determine that the whole building is above BFE. Once you know what the flood zone and elevation is, contacting an insurance agent for a detailed quote is essential. Foreclosure and Sheriff's sale: Why the lender gets the house. Every so often, you'll hear about buyers that want to buy property "at the courthouse steps" in an auction as part of a foreclosure. Almost all of the time, the lender gets the property. Why? More often than not, the minimum bidder the lender will accept is more than what the property is worth. Just the outstanding mortgage alone is more than what the property is worth. On top of that, take into consideration other costs such as delinquent property taxes, legal fees, etc and the property loses it's "bargain" potential. For example, there is a property I know of going to auction later this month. The current owner owes twice what the property is worth. No buyer will bid on that property because they can buy a different property for half what the bank will accept. They will also be able to buy a property that they have been able to inspect, tour, visit, etc. prior to making an offer. 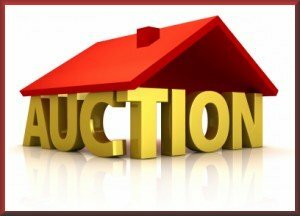 Lack of access to the property prior to the auction is something that needs to be taken into consideration. Chances are there is little or no access to the property before hand, so a property that may look OK from the street may be a disaster inside, which may lead to significant expenses to repair. Also, if the property has tenants in place, it will be you're responsibility - and expense - to evict them. Most buyers will not pay more than what is owed since it is often more than market value. Buyers at the courthouse steps are typically looking for a bargain. Nearly all properties sold at these auctions are not bargains, so consequently the lender gets the property. As Realtors, there is one question we get asked on an almost daily basis - How is the real estate market doing? The answer . . . Pretty good! Here is a comparison of the second quarter of 2013 to the same time period last year. You can see that the average sales price in every category is climbing upward. Additionally, there have been more closings in nearly each category. The combination of increased sales and higher average sales prices is a good indication that the market is not only stable, but steadily increasing. Naturally, the Realtor community is hoping that this trend will continue. Yes, there will always be that handful of sales that come in lower than expected. These sales are usually distressed sales such as bank owned properties or short sales. But overall, the numbers show that the market is improving. Interest rates are still low, and there are indications that they may rise again soon. Lower interest rates are most likely one of the main reasons we've seen such positive results in the market this year. It may sound like a cliche, but if you are considering a purchase in the near future, you will want to do it soon while rates are still low and there is still a good inventory to choose from. If you'd like to learn more about the real estate market in the Keys, don't hesitate to call or email me using the contact button at the top of this page. It's always bittersweet when a listing you love sells. This home was one of those sales. Located in a great Key Largo neighborhood, this home's big feature was the solar panel system that covered the roof of the home. One of the largest residential solar systems in the Keys, it allowed the owners to leave the AC on to maintain a consistent temperature all day, every day. It generated almost all of the home's electrical needs during the day. 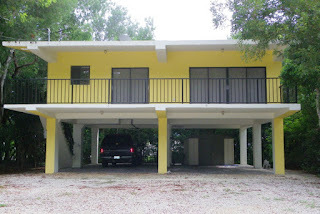 In addition, it had roll down hurricane shutters on every window, a large open floor plan, screened patio, covered parking and a legal, above flood ground level enclosure. It was a great listing and I loved showing it. Listed at $369,000, it sold for $365,500 and was on the market just 7 days when it went under contract. 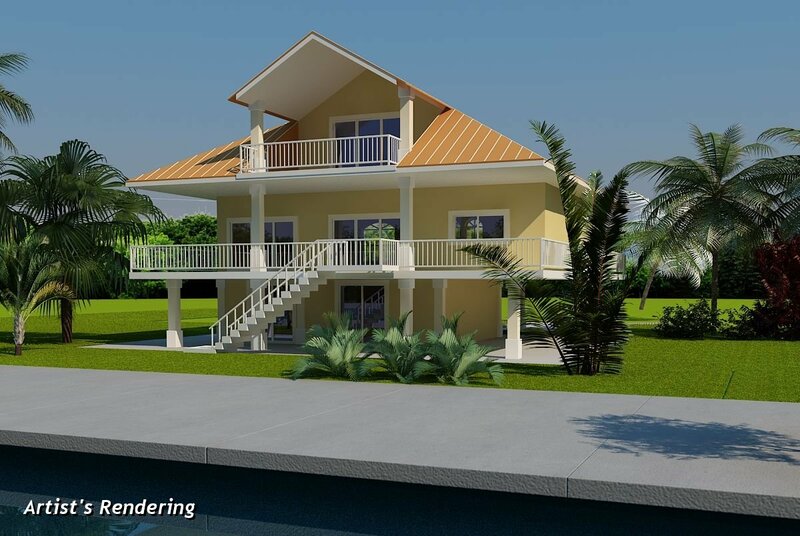 Learn more about this great home at www.72BahamaAvenue. New Listing - Waterfront lot with active permits and panotamic bay views! Located on a private dead-end street, this location will offer panoramic bay views from your new home. With it's location in Tavernier, everything is within easy reach - including grocery stores, schools, local marinas churches, parks and Mariner's Hospital. The property overlooks a wildlife area, so there are no other homes directly across the canal, adding privacy. Construction has begun, with the pilings, concrete foundation and concrete dock w/davit pads already in place on the lot. Price includes lot, active permits and full set of plans for a 3 BD/3.5 BA Keys style home with over 3,500 sq. ft. of living space. Home will feature ground level foyer, main living areas on 1st level and private master suite on 2nd level Each level has open patios overlooking the water. 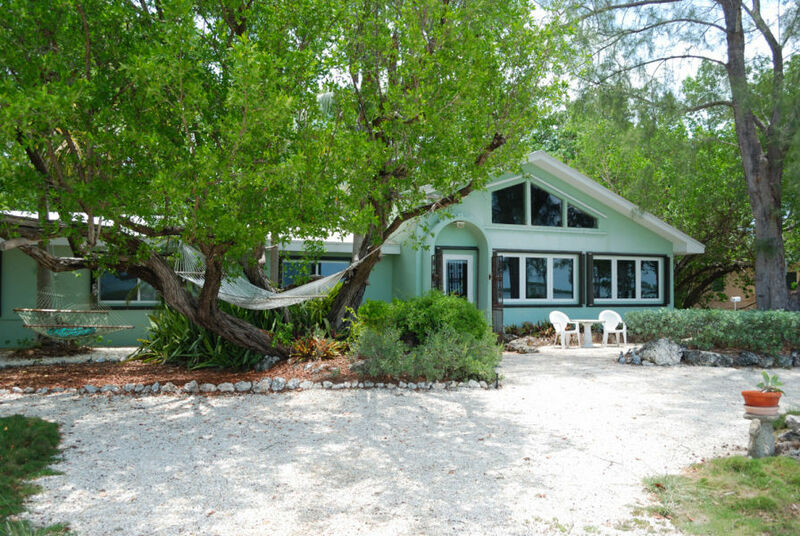 Boating access is easy, with immediate Bay access and very close to Tavernier Creek for quick Ocean access. 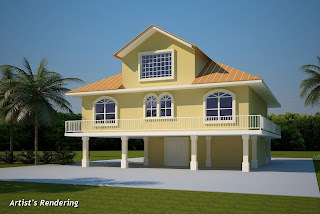 Start building today and make your dream if owning a home in the Florida Keys a reality! May was an active month in the Upper Keys. 91 new listings were added to the market, 78 properties went under contract and 79 closings took place. Among the new listings, there is a true fixer-upper listed for just $174,900. This 2 bedroom, 1 bath home has just over 1,000 sq. ft. of living space and is a nice neighborhood. It is also a Fannie Mae HomePath property, making a purchase possible with as little as 3% down. 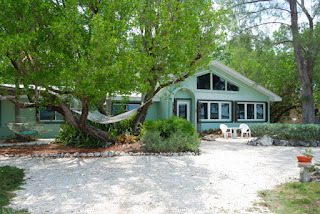 Pending Sale - 95401 Overseas Hwy. Pending listings include a 2 bedroom, 1 bath home that was just listed for just $134,900. This home sold very quickly within a matter of days. This all concrete home is located on the Overseas Highway at MM 95.4 and is in good condition with tile flooring throughout. 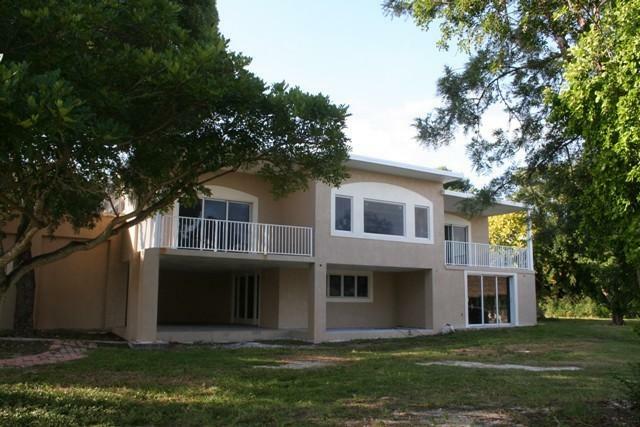 Sold listings included a large concrete home on a private airstrip with a boat slip in the marina. This was a bank owned home and was not yet completed. I imagine that we may see this property back on the market for a higher price once the new owner completes the interior. It was listed for $486,000 and sold for $64,000 over asking price. 1st Quarter of 2012 vs 1st Quarter of 2013. The 2013 selling season started strong and continues to be strong late into the season. Prices are starting to inch upwards in most property categories, with many experiencing a shorter marketing time. 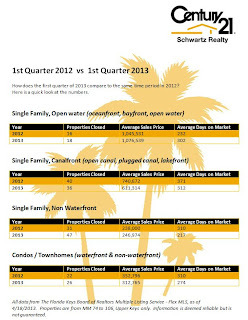 Here are the numbers comparing the first quarters of 2012 and 2013 in the Upper Keys. 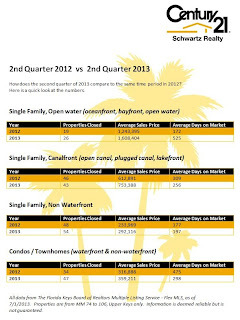 Open water properties had a slight increase in average sales prices as well as number of properties sold. 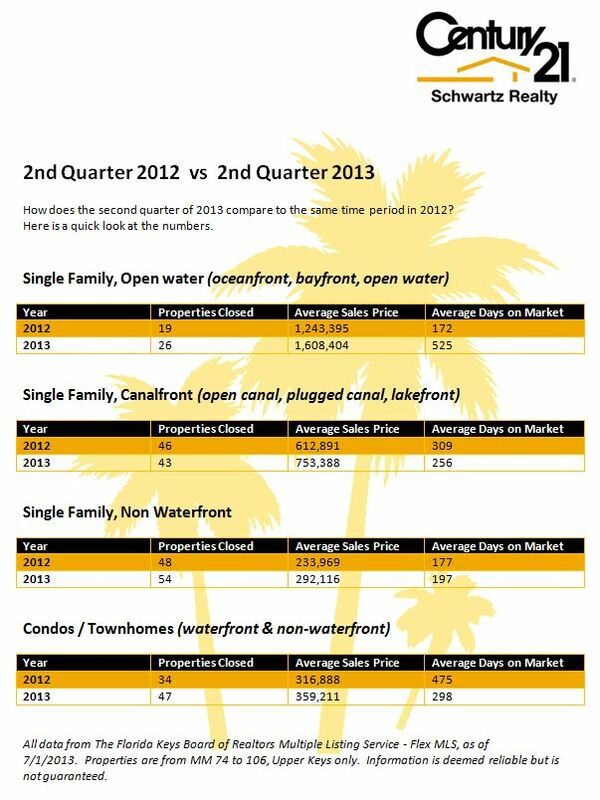 Canal front homes are selling quicker than they were in 2012. There was a slight dip in average sales price, but that was due to 4 very low priced bank owned properties and short sale properties that sold. Two of them were in need of significant repair before they could be lived in and sold in the low $200,000's. I suspect that we will see those properties come back on the market, with new renovations and a new listing price as well. I am confident that we will see an increase in average sales price when we compare the 2nd quarters of each year. Dry lot homes are doing well, with both an increase in price and number of listings sold. They are also selling quicker than they did in 2012. As always, properties that are priced correctly will sell in a relatively short amount of time. 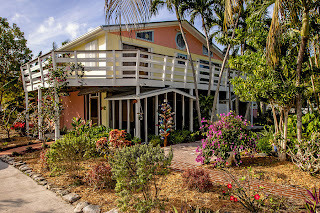 A new listing that I have at 72 Bahama Avenue in Key Largo was priced very competitively among comparable listings and was under contract in just 7 days, with multiple showings and offers. Stay tuned to see what the second quarter of this year brings. Downstairs you'll find an enclosure that is legal and above flood, providing ample storage. There is covered parking for your cars and/or small boat. The homeowners park is very close by and features a sandy beach, picnic areas and a community boat ramp. Additionally, there is another community park with baseball fields, water park and swimming pool, fitness track and more. Contact me for more information or to arrange a private showing. I'm pleased to announce that two of my listings have gone under contract, with closings expected to take place soon. 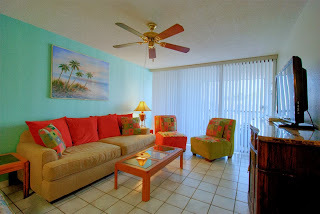 The first property to go under contract was the listing of a 2 bedroom, 2 bath condo at Moon Bay. This unit was on the market for just over 2 weeks when it went under contract. Offered turn-key & tropically furnished for an island lifestyle. This top floor end unit has been upgraded & is handicapped accessible with elevator, low threshold entry & shower, tile floors, widened doorways, & more. The second property that was put under contract was a vacant lot in Key Largo with approved plans and active permits for a 5 bedroom, 3 bath home just one lot from the open water. Just minutes to great fishing & diving spots in the Keys, including Elbow Reef, Carysfort Lighthouse & the famous Spiegel Grove. Close to the 18 Mile Stretch, making this a perfect choice for commuting to and from the Florida Keys from South Florida. The market is very active right now, so if you're in the market to purchase, act now while rates are still low and there is a nice selection in inventory. Moon Bay . . . a gated, private condo community located in the heart of Key Largo at mile marker 104.3. This complex has a resort feel to it, with landscaped grounds and ample dockage in the private marina. Amenities at Moon Bay include a large heated swimming pool and adjacent wading/children's pool, two lighted tennis courts, marina with deeded slips and bayfront tiki, spacious club house with rooftop deck, boat ramp, as well as picnic & BBQ areas. 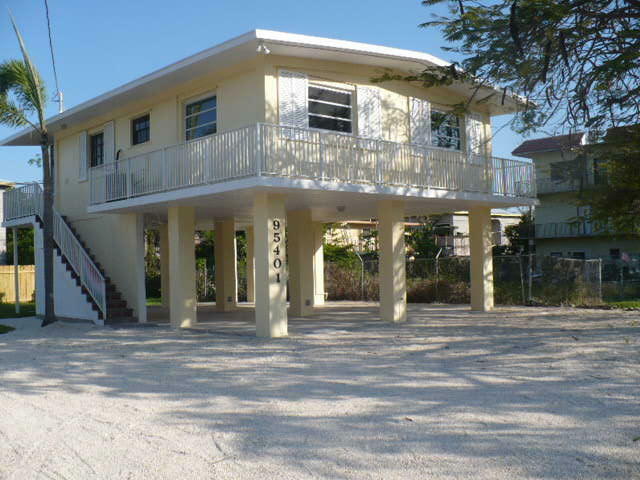 The complex is located on the Overseas Highway and has an electronic gate for added security. Each unit has assigned parking. 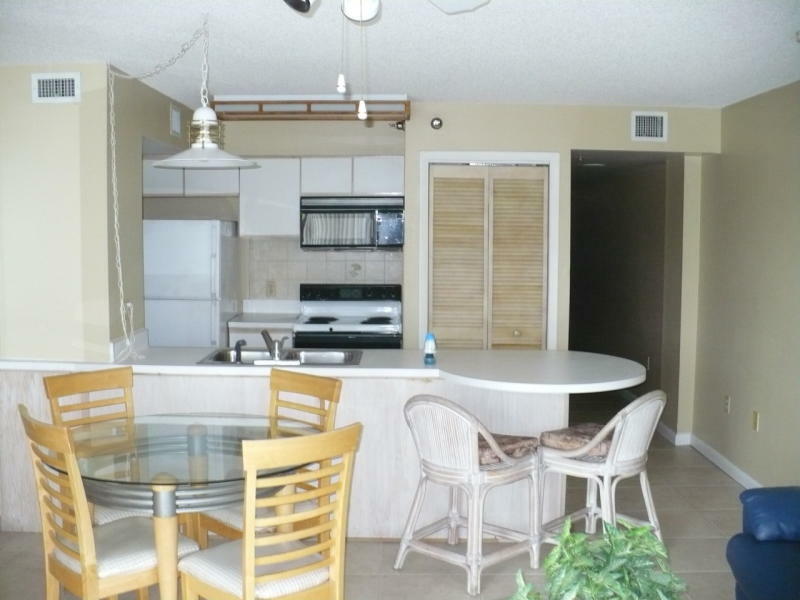 Weekly rentals are allowed in the complex, making this a perfect investment in the Keys that can use to generate income while you are not staying in your unit. A-501 - year round residence or vacation rental investment! Take in the bay views from this 2BD/1.5BA condo w/ deeded boat slip in the marina. Quick ocean access via Adams Cut. 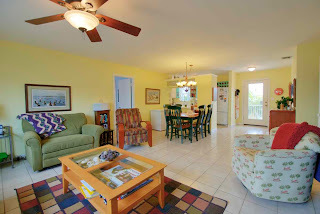 Offered turn-key & tropically furnished for an island lifestyle. This top floor end unit has been upgraded & is handicapped accessible with elevator, low threshold entry & shower, tile floors, widened doorways, & more. Its hard to believe that January is almost come to an end! Seems like New Year's Eve was just days ago! The third week of January saw 106 new listings placed on the market, 70 properties under contract and 25 properties closed. 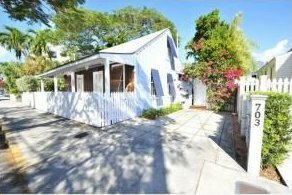 New listings include this perfect Key West cottage in the heart of Old Town, Key West. It features 2 bedrooms, 1 bath, and in-ground swimming pool and even has rare off-street parking. This is the life in Key West! It is listed at just $695,000. Pending sales include a home on Sugarloaf that has loads of Keys charm. Custom built, this 3 bedroom, 2 bath home has over 2,000 sq. ft of living space. 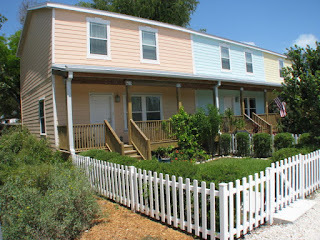 Located on a street that has homes on one side, and a canal on the other, this home has a small area for dockage. It was offered at $299,999 at tie of contract. Sold homes include a true fixer-upper in Key Largo in Stillwright Point. This 2 bedroom, 2 bath wood frame home. It has an above ground pool and does need a significant amount of work. Still, it is on an open canal with quick bay access and has the potential to be a great home. It sold for just $335,000. Craving some seafood? 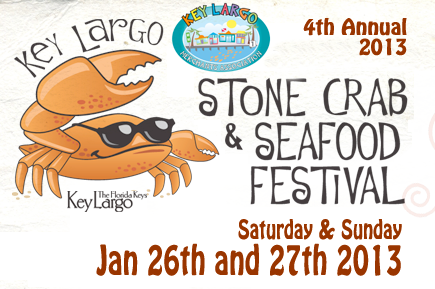 The Key Largo Stone Crab & Seafood Festival is this weekend! This weekend, January 26th & 27th, the annual Key Largo Stone Crab & Seafood Festival will be serving up some of the best seafood from the Florida Keys. Held at Rowell's Marina Mile Marker 104.5, bayside, this annual festival draws people from all over South Florida. Admission is just a small $5 fee. Children under 12 are free. It's not just about wandering from booth to booth, though. There is a full schedule each day, with conch fritter eating contests, shrimp eating contests, cooking demonstrations, fishing demonstrations, games, live music and even a magic show. Not a seafood lover? No problem. There will also be burgers, hot dogs, sausage and chicken wings for the land lovers. Yearly Comparison - 2011 VS 2012. 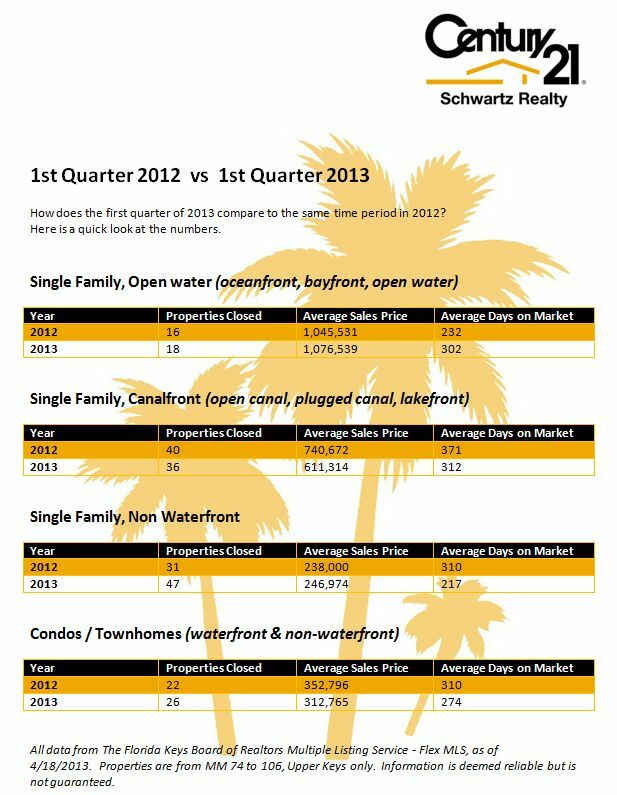 Is the real estate market in the Keys recovering? Every segment of the market saw an increase in average sales price. Most segments also saw an increase in number of sales, while canalfront home saw a slightly lower number of sales. 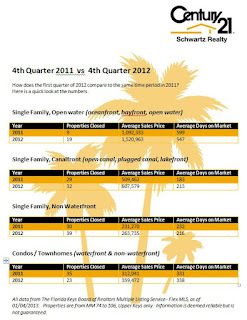 Condos were the most affected in terms of number of sales, with 107 closings in 2012 compared to 134 closings in 2011. Overall, this is a good sign that the real estate market is enjoying a healthy recovery. Prices are not surging upward at dramatic rates, but they are increasing. If you're considering a purchase in the near future, now is the time to make a move while prices are still improving and rates are still competitive. What are your thoughts? Do these increases indicate a recovering market? Please share in the comments section. If you're considering listing a home in the Florida Keys, now is the time to do it. Selling season is upon us and the number of sellers placing their home on the market this past week certainly seems to confirm that. 127 new listings were taken, 69 properties went under contract and 19 properties sold. 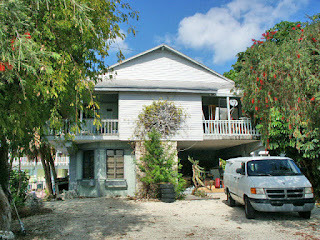 Pending sales include a very nice canalfront home in Key Largo. This large 3 bedroom, 3 bath home has over 2,000 sq. ft. of living space - which is a large home by Keys standards. All concrete construction including the roof. It was offered at $875,000 at time of contract. 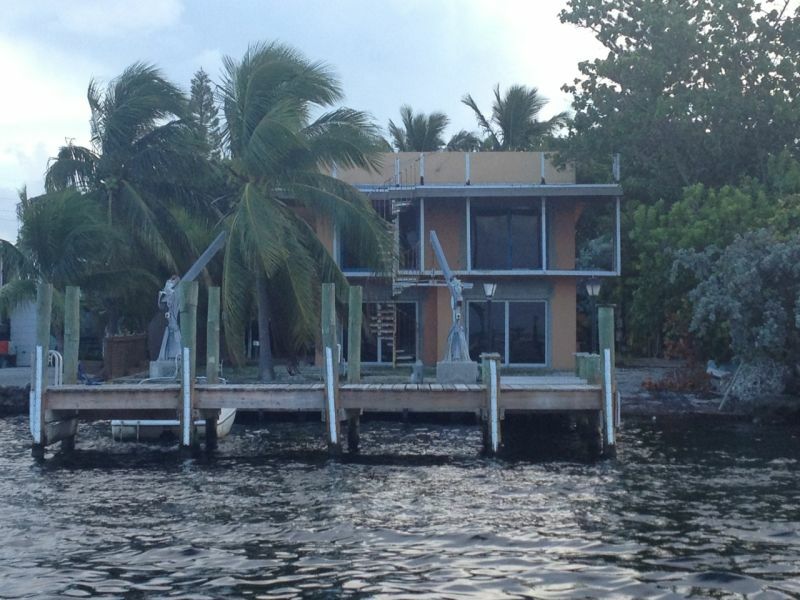 Sold properties include a spacious home overlooking Florida Bay, with dockage right out your front door. This 3 bedroom 2.5 bath home has over 2,000 sq. ft. of living space and gorgeous bay views. Originally listed for $875,000, it sold for $685,000. Pier House Resort and Caribbean Spa, one of Key West's most recognized resort hotels, is up for sale. 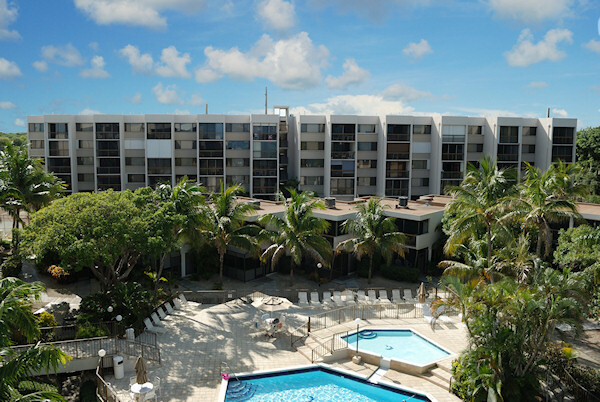 Opened in 1968, this 142 room resort has a long history in Key West, and many credit the resort with transforming Key West from a military Navy post into the popular tourist destination it is today. The property was built in stages and each building has unique characteristics and personality. Currently run as an independent hotel (not associated with any brand or chain, this could easily be branded by an luxury hotel or resort chain. The price has not yet been determined. A New York based firm has been selected to market and sell the six acre property. 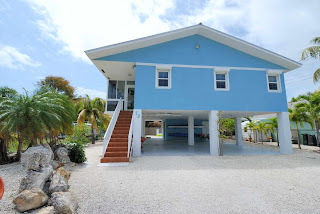 The property has a private beach, pool, three bars, restaurant, spa, fitness area and conference center, and is located at the very end of Duval Street, affording the resort beautiful water views and year round sunsets. It's a brand new year and so far, 2013 is off to a good start! 77 new listings came on the market, 39 properties went under contract and 22 properties sold. 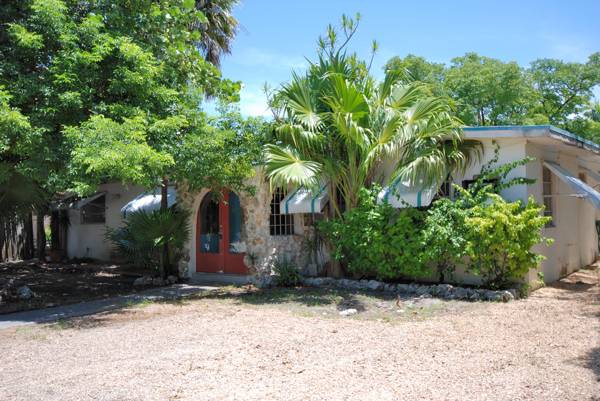 New listings include a small fixer upper in the historic part of Tavernier. 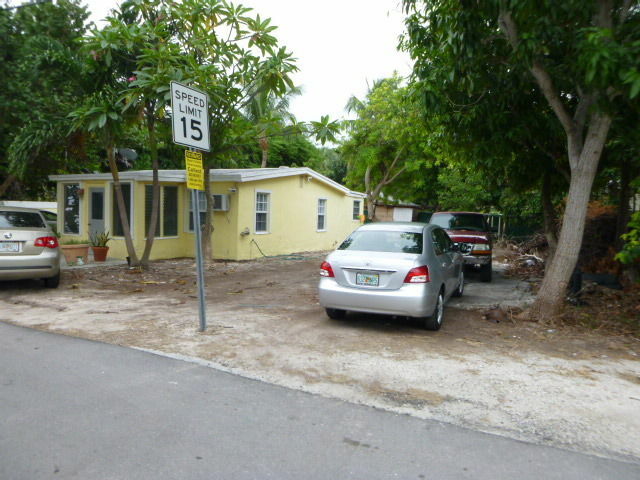 This 2 bedroom, 1 bath Keys cottage is on 3 lots, making a nice sized piece of property. It is bank owned and offered at just $150,000. This is probably going to sell fast! Pending sales include a listing that I wrote about last week on the open water for just $510,00. Just as I thought, this property went under contract very quickly - 22 days. It is a 3 bedroom, 2 bath home and is currently gutted. This is a bank owned property. Closed sales include 3 bedroom, 2.5 bath townhome that is deed restricted as affordable housing, with down payment assistance. Built in 2008, these townhomes are styled in a Key West type of architecture and are close to schools and shopping. This unit was listed at $145,000 and sold for $135,000. Listing information is gathered from the Florida Keys Board of Realtors MLS (Multiple Listing System). Listing links will automatically expire after 2/7/2013. 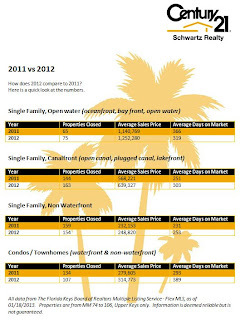 Prices appear to be on the rise in the Upper Florida Keys. 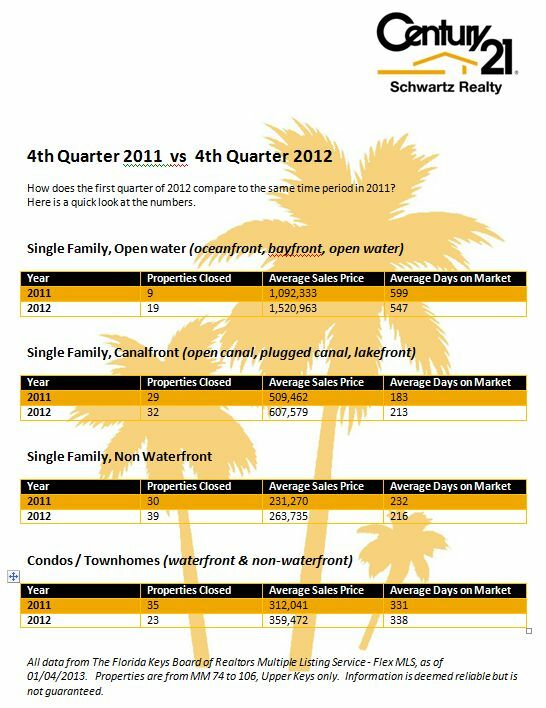 The average sales price for waterfront homes, dry lot homes and condo/townhomes rose in the 4th quarter of 2012 compared to the same time period in 2011. The number of days on market, or marketing period, remained fairly consistent throughout the various types of properties, with canalfront property having the shortest marketing time of 213 days on average. 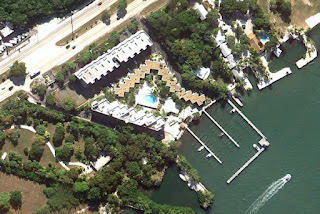 If you're thinking of investing in property in the Florida Keys, now is a great time to do so. Rates are still low and there is an ample selection of available property to choose from. Click the chart to the left to view a larger version. 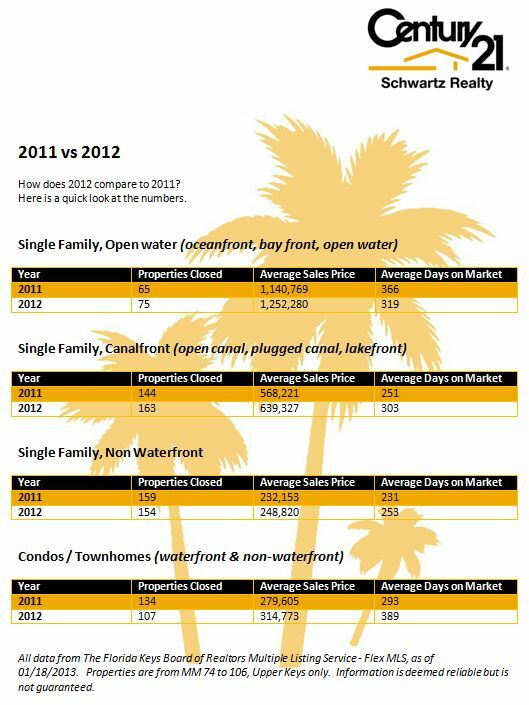 The year 2012 finished on a strong note, with 154 new listings coming on the market, 82 properties going under contract and 91 closings taking place. 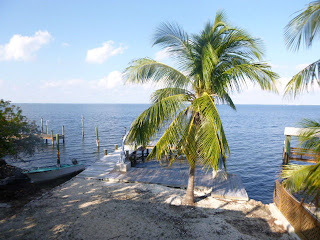 New listings include a bayfront home in Key Largo. It is completely gutted and does have some code issues, but with the right amount of effort, it could become a great waterfront home. It is on a very nice bayfront lot with dockage and boat ramp. It is bank owned. Being offered at $510,000, this will sell very quickly. 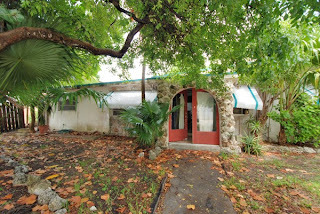 Pending sales include an all concrete home in a nice location in Key Largo. It has updated kitchen and baths and covered parking under the house. It has 3 bedrooms and 2 baths with just over 1,200 sq. ft. of living space. It was offered at $279,500 at time of contract. Sold listings included a bank owned unit at Ocean Pointe. 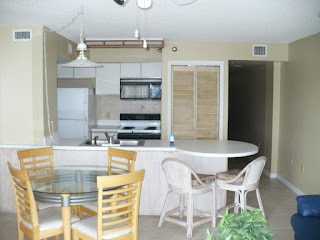 This 2 bedroom 2 bath unit is was even sold fully furnished at an incredible price of just $168,000. These units make excellent investments with rentals being allowed for as little as one day. 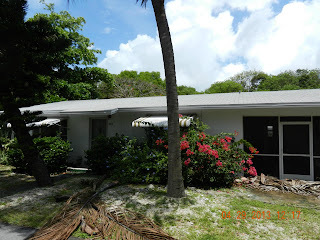 Listing information is gathered from the Florida Keys Multiple Listing Service. Listing links will automatically expire after 2/2/2013.